The Bubble Meet was originally started to get a group of friends to regularly meet up for a chat and some food and drink. Friends from various car clubs were also invited and as time went on the Bubble Inn evolved into a friendly monthly meet for like minded people in a variety of cars. Regulars as well as first timers, young and old. Families are welcome. We meet at the Bubble Inn, Stenson once a month on a Sunday afternoon. The meeting is from 12.00 midday until about 4pm. We park in the car park opposite the pub (see picture below). If it is dry, we park on the grass area next to the car park. 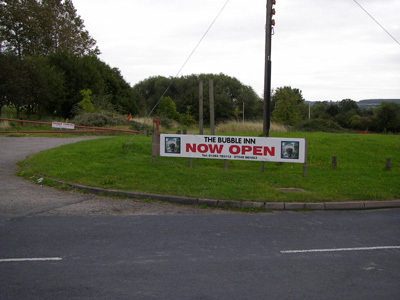 The Bubble Inn is a unique venue with a canal side setting which has been converted from a 200 year old barn into a public house serving high quality food and drink all day, every day. 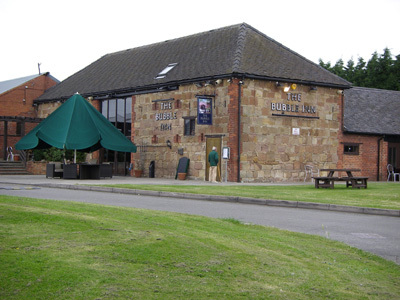 The pub is 200 yards from the Bubble Wharf. 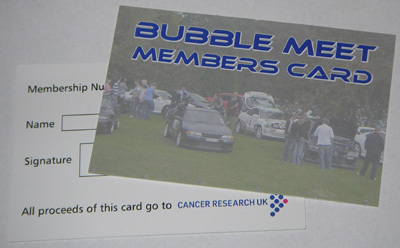 A Bubble Meet membership card is available at the meet for anyone attending. It costs £1 with all the money raised going to charity (Cancer Research UK). The card when presented at the bar entitles you to 10% discount off your food (drinks not included) anytime you visit (not just on the day of the meet). Leave at Junction 24 and take the A50 towards Derby, leave at Junction 3 and take the A514 towards Swarkestone. Just before the Crewe and Harpur pub, turn right onto the A5132 towards Willington. After about 2 miles take a right turn signposted to Stenson/Findern, this will bring you into Stenson, turn right over the railway bridge and the car park is on the right. Leave at Junction 24A and take the A50 towards Derby, leave at Junction 3 and take the A514 towards Swarkestone. Just before the Crewe and Harpur pub, turn right onto the A5132 towards Willington. After about 2 miles take a right turn signposted to Stenson/Findern, this will bring you into Stenson, turn right over the railway bridge and the car park is on the right. Leave on the Derby ring road (A5111), following the ring road in a clockwise direction, passing the Showcase cinema on the left hand side. Stenson is signposted on the junction to the left at the next roundabout. Continue straight ahead until you reach an island, continuing straight ahead until you reach the pub with the car park on the left. Leave at the junction where the A50 and A38 cross onto the large roundabout. Follow the markings on the road saying B5008. Leave by the B5008 exit, signposted to Willington. Then turn left, taking the A5132 towards Swarkestone. After the cooling towers on the left, take the next left turn, signposted Findern and at the next junction turn right towards Stenson. When in Stenson, turn left over the railway bridge and the car park is on the right.